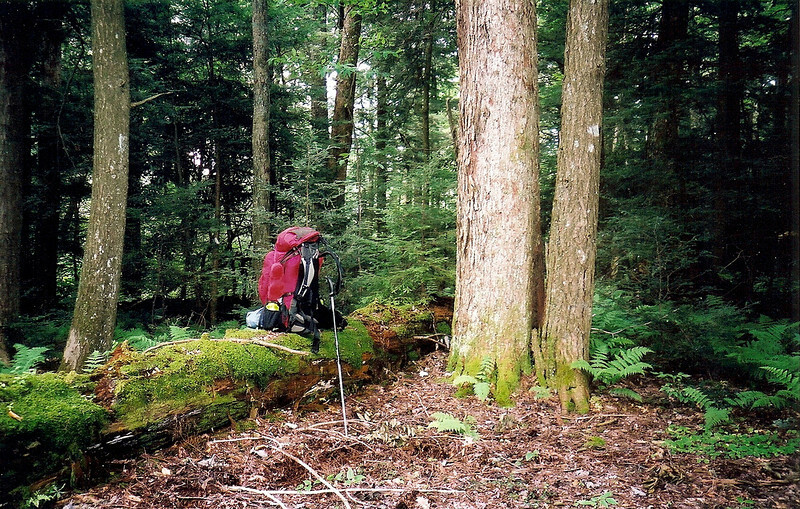 I leave the Nutbuster at Naked Ground and swing over Bob Bald and head north on the Fodderstack trail to Hemlock Grove Camp near Glenn Gap where I spent my first backpacking night in the Citico on Trip 1. Compare it with my photos from Trip 2 with Little Mitten. Morning comes after a night of rain and wet fog coating the tent with moisture and cool temps. The sun seems to be trying to poke out thru the morning soup which will if true get me to slowly pack up and leave this high gap for a hike on the Fodderstack. I'm sure the 4 from Atlanta will be breezing thru here on their way back down to the Kilmer Loops, probably via the Little Santee trail. I left the Gap and hoofed it up to the Bob in the rain and heard some voices so I dumped my pack at the usual green grassy tentsite and made my way to the MSR tent camp of a couple from Atlanta, a hip Sierra Club couple to whom I lent my can opener. I guess since they're here I'll stay put too and move out tomorrow past Snow Camp and points north to Crowders. Dark clouds are headed my way so impending rain is certain, just give me a lightning free blast area. I'm a sitting duck but let it be known that it is my choice and anyway, it could strike at Snow Camp or Crowders just as well. Now a heavy rain comes to the Bald as I sit in my tent waiting it out and wanting to walk around and explore each square foot of it though I do not want to disturb Mister Snake. The daddy long legs are everywhere in the grass and I must shoo them off repeatedly so they won't get in the tent. It stopped and I went outside for a break and then it came again, a Sunday rain. It's the rule of this roost but so far there has been no lightning blasts to weaken my heart's resolve, just a steady pounding rain to put one to sleep. At least I am sharing this wet afternoon with 2 other backpackers 50 yards away. They have a Kelty tarp and an MSR Zoid tent to keep them warm and dry while I sit in my roomy dry tent on thick green grass at the Raven's Yard. Ok, at 3:30 pm a gully washer hits the tent and the pounding water forces tiny droplets thru the fly and onto the front net door lightly touching my face. This is the hardest rain so far for the trip and it is reminding me of a recent trip with an uncomfortable 40 hour rain. This is a 3 hour rain and I ain't too worried about it one way or the other. I'd rather be here than walking on the trail someplace, ok? Well, the storm has passed and a late afternoon sun shines down on me and it feels like South Dakota all over again. The Atlanta couple passed me by and I waved but from here on out I can't be too friendly due to our opposite natures. So I hope to get an early start tomorrow for a journey to Crowders and take my precious can opener with me. As I made my rounds over the bald I saw many tent prints from backpackers this weekend but they skedaddled early today and were gone when I got here. The 2 from Atlanta are nonhackers anyway since they took the Wolf Laurel cheater's trail.